As I was thinking of new ideas for my next post, they all became unreachable. It seems like no one would like to talk to a journalism major about nutrition on campus, or anything regarding campus dining for fear of their jobs. My last post, the staff member at the Sandwich Factory said she liked her job and did not want her name posted, and yet again another staff employee has asked for his/her name to be anonymous. Q. Do students complain to you about the food? A. I have not heard students complain about the food. Q. Do you think it’s smart to ban fast food restaurants in San Luis Obispo? A. No. I wish these establishments would offer healthier food options. They are businesses in our community that employ residents, so they contribute to the economic vitality of our community. Q. Have you looked at the nutrition online, and what’s your opinion it? A. I have not looked at the nutrition information online, but I think it is helpful to make people aware of what they are eating. I am aware that many of the food items at all types of restaurants have more calories, fat, cholesterol and sodium than people think. This anonymous employee also said he/she has not been in the dining halls, therefore, cannot comment on whether or not healthy and nutritious foods are being offered. It seems to be that the Campus Dining is constantly under change. Sometimes for the good, and sometimes it takes a bad spin. In the beginning of the year, the portions were HUGE. Campus Dining must have gotten complaints because when I opened my to-go box one afternoon, the picture on the left truthfully shows what I found inside. 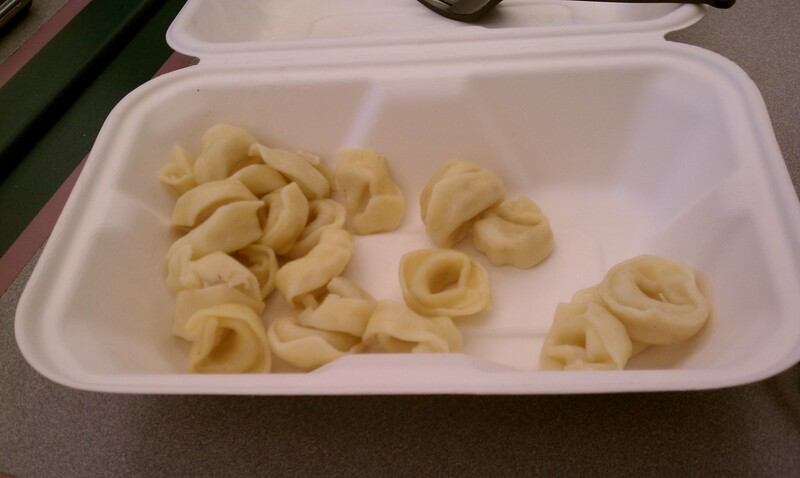 It was only $4.00 for plain pasta, but it was still a little upsetting to know this is what I get for paying for a meal plan. I no longer order pasta because I feel ripped off, and the quality is not worth it either. Students should not expect a five star restaurant, but don’t we deserve a little better? Who would like to take the chance of getting sick off the food? Is it smarter to direct your meals toward staple products such as water, milk, or juice? A lack of participation led me to the idea of comparing dining halls and their food between Cal Poly, a UC, and a private university. 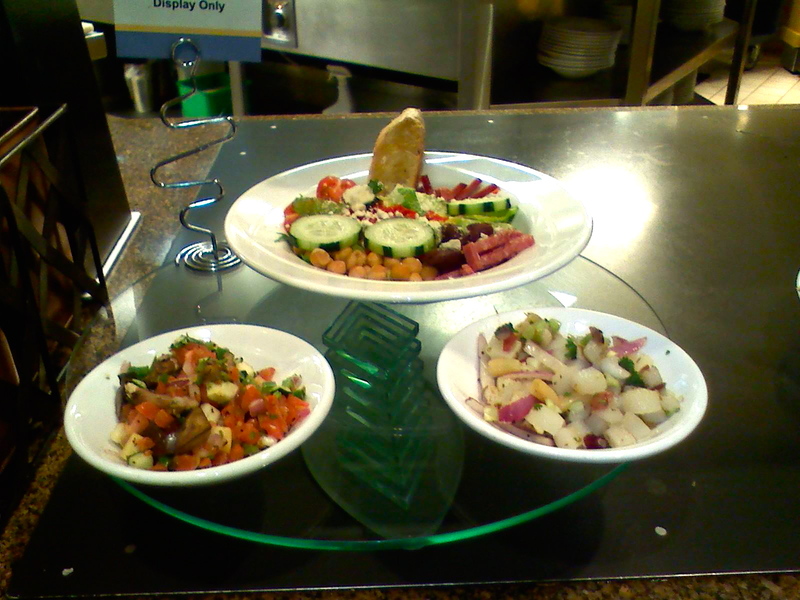 The food at Cal Poly is definitely not the best; it’s manageable, but could vastly be improved. After going home for the Winter Break, I learned how far off our dining is in quality compared to other schools. The top cafeterias I have heard great things about are at the University of Southern California and the University of California, Los Angeles. “Campus food is better than I expected, and there’s a pretty decent variety. There are a lot of vegetarian food options [I’m vegetarian] and it seems relatively healthy. The desserts are definitely the best part!” -UCLA student Anjali Mehta. Chefs prepare the meals and appealingly display the food options for the day. As a first year Bruin, Anjali Mehta is so far content with the food options, being vegetarian as she is. There are salad options and different entrees available that cater to everyone including vegetarians. Mehta also said the food is healthy, and you can check the nutrition facts on each day’s entrees served. Similar to UCLA, the University of Southern California has extraordinary dining as well. Online, the USC Hospitality website provides information on campus dining. One of the dining restaurants called EVK Restaurant and Grill, apparently is not a favorite among Trojan students, but seems rather similar to our very own, VG’s Cafe. “EVK is also known as Evil Kitchen according to students,” said USC history major Julia Kirchhofer. A lot of students call it the Evil Kitchen for some of its unappealing dishes. USC promotes EVK as a restaurant with fine cuisine from all over the world, with an outdoor barbeque and indoor and outdoor seating. Kirchhofer may not enjoy EVK as much, but has said to be enjoying the other food options available. 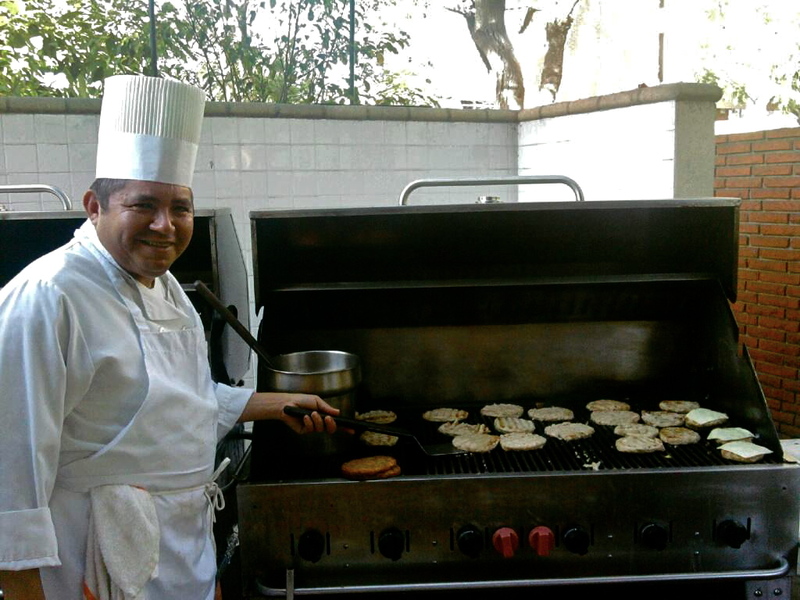 She and other students can choose from USC engraved waffles to fresh burgers on the grill to a Korean glazed pot roast. 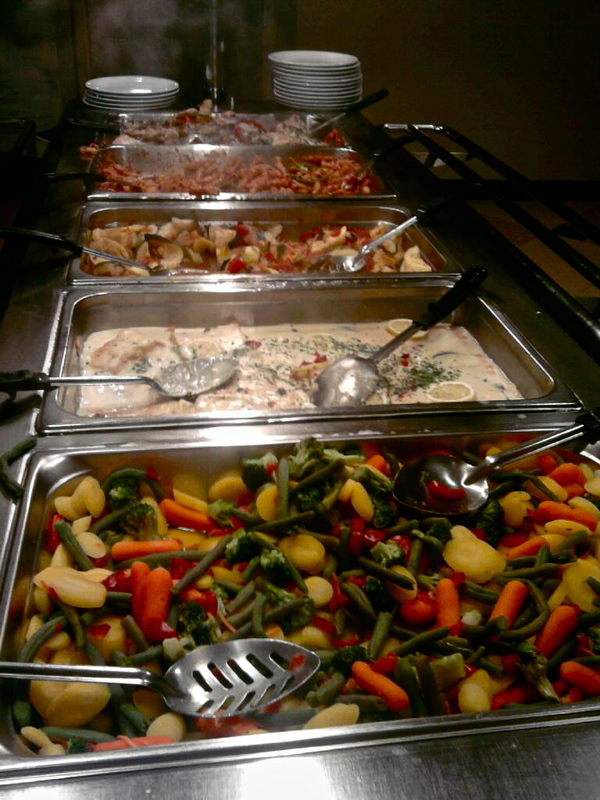 All meals are prepared by chefs catering to students’ tastes. The dining atmosphere seems friendly and high quality. USC is a private school, so it is assumed that their dining is nicer than most. Although, I don’t expect top of the business chefs to be hired at Cal Poly. It just seems it would be nice for an upgrade in our dining restaurants. I know it is hard to satisfy every student’s taste, but so many students complain about the quality. Who is in charge of mandating what is cooked every day each week for students? Going back to EVK at USC, it sounds very similar to metro as well, but the food looks nothing in comparison. Apparently, the food shown is not very good, although, do those vegetables not look fresher than the ones offered at VG’s and Metro?? I know my vegetables have never looked that fresh, and always have some bizarre seasoning coated on them. New changes in the menu, or however the food is prepared would greatly enhance the quality in the food. I think I speak for numerous students when I say, upgrade please!! Any ideas? Comment on how you think campus food should be changed, follow another campus’ dining, or remain the same. Thank you for writing about this. Cal poly dining is pretty terrible and more people should be aware of how awful they are eating. I totally agree with your blog. I think the food on campus needs a big reform. Prices are inflated and the quality is fair to even less than fair. Students should expect better and healthier food with the amount of money we are paying for. We are customers too, just because we have paid ahead of time does not mean that they can stuff us up with anything. We need an upgrade please!!! !